Quiet and refined, the PK draws on the dependable GH7 six cylinder engine to deliver 250 horsepower and 716 Nm of torque, giving you a truck that tackles the difficult tasks. This truck is exceptional value for money with a durable driveline and cab that delivers on safety and comfort. Choose between airbag or leaf suspension plus a range of other standard features to tailor this outstanding truck to your individual needs. With the 5-speed Allison automatic transmission, this truck delivers smooth trouble-free operation. You can be assured the PK will match the demands of your business in any local or metro distribution activities. All PK series come standard with UD's reliable six speed manual gearbox. The UD six-speed manual features a power shift mechanism that reduces shift effort for the driver. UD Trucks has taken a proactive stance in active safety with the inclusion of ABS and wheel park brake as standard features across the entire truck range. ABS enables drivers to maintain steering control under severe braking conditions in an emergency or low traction conditions. PK models feature a Wabco four channel ABS system. 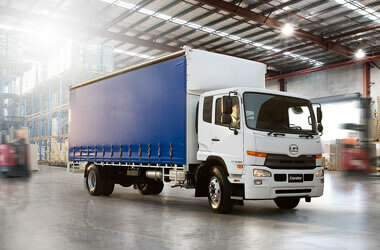 UD was the first Japanese manufacturer in the Australian marketplace to offer Front Underrun Protection on its 16t GVM range of PK models. Apart from the added safety credentials the major advantage for operators is the ability to increase the trucks GVM by an extra 500 kg when FUPS is fitted. 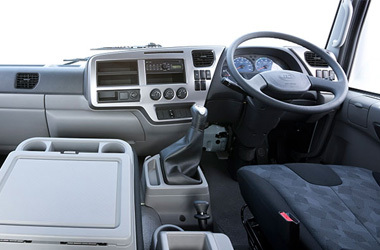 FUPS is designed to ensure the safety features fitted to passenger cars, such as air bags and crumple zones, are deployed during a front-on collison with a heavy vehicle. 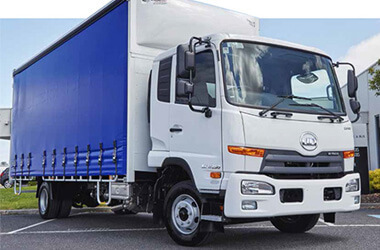 UD is the first Japanese truck manufacturer to provide the highest level of cab strength, meeting the stringent ECE - R29 compliance in the PK range. 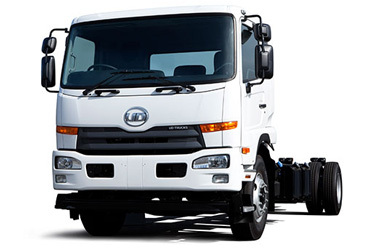 UD is the only Japanese truck manufacturer to offer the option of either steel leaf or air bag rear suspension across the entire Australian medium duty range. All PK models can be optioned with Hendrickson Road Friendly Suspension (RFS) HAS230 at the rear of the vehicle. UD Trucks medium duty models utilise long taper leaf springs at the front of the vehicle, matched to double acting telescopic shock absorbers. Made from Drop forged steel "L" section beams with reverse "ELLIOT" type design, the front axle loads are a bif 6500 kgs.